*When mesquite and pecan trees leaf out. *The return of the scissor tails means it is safe to plant your tomatoes. (Tyrannus forficatus) has a long, forked tail. The bird is 13 inches long from beak to tip of tail. 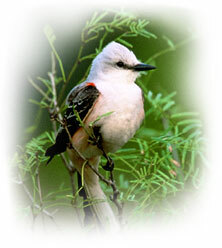 Typical of flycatchers, it feeds on insects, making it a very valuable bird when it comes to controlling insect pests. Insects consumed include moths, butterflies, grasshoppers, locusts, beetles, and cotton worms.